Tom Sherry joined the National Ski Patrol and completed his training in Winter Emergency Care (WEC) in 2001. He has served at Northstar, a Vail Resort, in both volunteer and professional patrol roles. In 2005, Tom became an NSP Outdoor Emergency Care (OEC) Instructor, teaching the fundamentals to new patrollers. 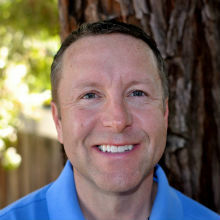 Later in 2006, Tom's passion for outdoor sports safety, leadership and education led him to become an NSP Senior Trainer, responsible for training other OEC instructors from the Western Region. Tom's leadership skills were leveraged further by the NSP in 2013 when he was elected to the National Board of Directors, which operates out of Denver, CO. He chairs the planning committee which crafted the long range strategic plan for National Ski Patrol. Tom was part of Group Experiential Learning's original Mountain Rescue program development team and flys to resorts around the country to lead our off-site programs.